As a former champion and a man in the form of his life, Arthur Lanigan-O’Keeffe went into the men’s individual final at the ECMP European Championships with high hopes, only to end the day with mixed emotions after finishing ninth. On the one hand, it was the Kilkenny star’s second-highest finish at the Europeans, where he enjoyed a stunning breakthrough victory in Bath in 2015. On the other, the 26-year-old was firmly in medal contention after two disciplines and, ranked No.4 in the world, would have fancied his chances of a medal on the back of a stunning UIPM Pentathlon World Cup season. In the end, there were positives to be taken from another top-10 finish for an Irish pentathlete at one of the world’s toughest competitions, 24 hours after Natalya Coyle finished fifth in the women’s final and won team silver alongside Eilidh Prise and Sive Brassil. The history-making Irish team ended the championships in Székesfehérvár, Hungary with two medals – Prise and Kate Coleman also won silver in the women’s relay last Tuesday. “It wasn’t a perfect day, but it’s another solid performance,” said Lanigan-O’Keeffe. “It could have potentially been more but in pentathlon you can’t expect to win a medal every time, and this season has gone really well so it’s all positive. “I’m happy with my fencing, because it was my problem last year. I worked on my running really hard and that has paid off, but it was fencing that killed me at the World Championships and the Olympics. Now my fencing has improved and hopefully I can get the running form back for next year. “We’ve done competition after competition, entering everything we could enter since World Cup Los Angeles in March, so we weren’t perfectly rested or tapered for the Europeans and my legs were a bit sore this evening. But I had one pretty dodgy shoot and that was it. The day began well for Lanigan-O’Keeffe, who recorded the third-fastest swimming time of 2:02.82 and then competes strongly in fencing, securing 21 victories and 13 defeats. That left the two-time Olympian in fourth position overall, but unusually he lost points in the riding arena, knocking down two barriers to incur 14 penalty points. With that, he started the Laser-Run back in seventh place, albeit only seven seconds behind the podium places and 17 seconds off the lead. With the form he showed in the 2018 World Cup, winning gold in Sofia and then bronze in the final in Astana, Lanigan-O’Keeffe would have been justifiably confident about threatening the leaders. It wasn’t to be, however, and he ended up dropping two places with a time of 11:17.71. Ahead of him there was yet another reason to celebrate for French sport, as Valentin Prades emulated Marie Oteiza in winning individual gold, two seconds ahead of Hungarian home favourite Adam Marosi. Joe Choong of Great Britain claimed the bronze. The European Championships will be an Olympic qualifying event in 2019, as it was in 2015 when Lanigan-O’Keeffe conquered the field and propelled himself into the reckoning for Rio 2016, where he finished eighth. The next event on the calendar in this record-breaking season for Ireland’s pentathletes is the UIPM Junior (Under 23) World Championships in Kladno, Czech Republic, from 29 July to 8 August. Earlier this year, Lanigan-O’Keeffe ended the World Cup season in style with a gold medal followed by bronze in the final, while Coyle (27) finished fourth in the final after winning silver in Sofia. Prise (22) made a big impact at the recent World University Championships in Budapest, where she was sixth in the individual and fourth in the mixed relay alongside Michael Healy (20). 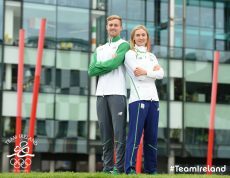 In May, Coleman (28) teamed up with Healy to win an excellent silver in the mixed relay at the World Cup event in Kecskemet, Hungary, while Brassil (24) finished 14th in the first two events of the season in Cairo and Los Angeles.